Quadrantids Major annual METEOR SHOWER, active between January 1 and 6. The sharp maximum, on January 3 or 4, can produce zenithal hourly rates (ZHR) of up to 130 meteors/hr, but activity at other times is usually rather low. The shower is named after its RADIANT in the obsolete constellation of Quadrans Muralis, the stars of which are in what is now identified as northern Bootes. Quadrantid meteors show a number of characteristics typical of a cometary origin, but identification of the stream parent has been rendered nigh-impossible by the stream's rapid orbital evolution. One possible candidate is the faint short-period (5.24 years) comet 96P/Mach-holz 1. Repeated close passage at aphelion of the stream orbit to Jupiter has led to a considerable spread of its component meteoroids. Computer modelling suggests that the stream was active from a radiant in Aquarius during July until the early centuries AD, before being perturbed away from encounter with Earth. Chinese and other annals provide evidence for this shower. Having been inactive for over a thousand years, the stream began to be encountered at the descending node of its orbit once more from about 1700 onwards, as the modern Quadrantid shower. Projecting the computer model into the future, the stream orbit is expected to be pulled away from Earth around 2200. The January Quadrantids have been known since about 1835, with a more or less continuous observational record since the 1860s. There is apparent variation in the peak activity, with some remarkably high returns, notably in 1977 and 1992. Although widely spread at aphelion, the meteoroids are encountered by Earth close to their perihelion, where the stream is concentrated and has a narrow cross-section. Consequently, the peak activity is restricted to a comparatively brief period, less than 12 hours. At a given location, perhaps only one return in ten years may prove favourable, with the maximum occurring during the pre-dawn hours when the radiant is highest, and in the absence of clouds and moonlight. The Quadrantids show evidence for particle mass-sorting, with faint meteors being proportionally more abundant in the early part of the peak, and bright events (produced by larger meteoroids) peaking later. This is consistent with the smaller meteoroids gradually spiralling towards shorter period orbits as a result of the POYNTING—ROBERTSON EFFECT. Dispersal of Quadrantid stream meteoroids is also reflected in the observation that the shower radiant is relatively diffuse, except close to maximum activity. Quadrantid meteors are medium-paced at 41 km/s (25 mi/s). The fainter examples are often described as bluish, whereas the bright Quadrantids sometimes show a pronounced yellow-green colour. quantum theory Theory introduced by Max PLANCK and Albert EINSTEIN at the beginning of the 20th century that showed that light really has a dual nature: it can interact with matter either as a particle (photon), exchanging energy and momentum, or as a wave, producing interference and diffraction phenomena. In 1924 Louis Victor de Broglie (1892—1987) introduced the concept that all forms of matter possess the dual behaviour of particles and waves. The de Broglie wavelength Xd of a particle is given by Xdp = h, where p is the momentum of the particle and h is the PLANCK CONSTANT. Clinton J. Davisson (1881—1958) and Lester Germer (1896—1971) experimentally confirmed the wave/particle duality of particles when they showed that electrons exhibit interference effects. Erwin Schrodinger (1887—1961) constructed a set of differential equations that describe the wave structure of atomic particles, and the laws that govern their interactions. Later developments in quantum mechanics, principally by Paul Dirac (1902—84) and Werner Heisenberg (1901—76), provided the backbone of the quantum theory of matter. The quantum-mechanical approach pictures the electron as a wave structure that resides in energy levels where the amplitude of the wave is greatest in the vicinity of the classical Bohr electron orbit. In the quantum-mechanical picture, there is a finite probability that the electron can be anywhere in the Universe, but the probability density is highest at the classical orbit or energy level. The quantization of electron orbits emerges in a very straightforward manner in Schrodinger's wave formulation: the 'orbit' corresponds to the region where there are an integral number of waves around the atom. This three-dimensional pattern can also be thought of as the probability density of a cloud of negative charge (integrating to the charge on a single electron) around the atom. The nucleus of the atom, being constructed of individual protons and neutrons, is also described by quantum mechanics. Its greater mass results in a more concentrated probability distribution than for an electron. Schrodinger's equation can be written down for any atomic system. It will include the effects of the electrostatic and magnetic interactions of all the constituent particles. The solution of this equation gives an exact description of the energy states of the system. Only in the simplest of atoms (hydrogen and helium) can accurate solutions — called wave functions or eigenfunctions — of the Schrodinger equation be obtained. For complex structures (atoms containing many electrons, or the atomic lattice structure of crystals) only approximate solutions to the Schrodinger equation are, in general, possible. Modern high-speed computers are capable of furnishing solutions of wave equations for quite complex systems. In the area of astrophysics, such solutions can give, for example, the energy levels and hence emission-line wavelengths of highly ionized species or complicated molecules not observable in the laboratory. The principal structures of atomic nuclei and the ways in which they interact are also governed by quantum mechanics. Some of the nuclear reactions of interest in the construction of theoretical models of stars cannot be measured in the laboratory because they occur at too low a rate. For such reactions, calculations of rates must be made, which involve solutions of the wave equations for the two nuclei as they approach, collide and recede from one another. The probabilistic nature of quantum mechanics provides an explanation for the ability of particles to 'tunnel' from one state to another (of equal energy) without having to acquire the extra energy to pass over the potential barrier that separates the two states. Such tunnelling, for example, allows nuclear reactions to occur at lower energies (and hence lower temperatures) than they would otherwise require. On a somewhat grander scale, attempts are currently being made to examine the properties of wave functions that represent the entire Universe, to see if the BIG BANG could be the result of tunnelling from a different state. quantum theory of gravity Theory intended to possess the predictive power of GENERAL RELATIVITY and to exhibit quantum properties. Einstein's theory of general relativity is based on a form of mathematics called differential geometry and also on the idea that SPACETIME is a CONTINUUM. Continuum theories differ from QUANTUM THEORY in several ways, the most basic being that there is some smallest size or unit in quantum theories, but not in continuum theories. Physically this means that a region of spacetime can be divided into infinitely small parts and there will never be a 'smallest' piece. The mathematical apparatus of each of these types of theories is totally different. Theories of the strong, weak and electromagnetic forces are all quantum theories and they are described by wave functions and probabilities. Gravitational theory, on the other hand, is described by differential equations on a continuous manifold. There are no uncertainties in general relativity and no discrete quantum states. Many physicists, including Einstein himself, have endeavoured to find a quantum theory of gravity that would retain the predictive power of general relativity, but also exhibit quantum properties. If one were successfully to develop such a theory, one would need to postulate the existence of an exchange particle that mediates the GRAVITATIONAL FORCE. This BOSON, called a GRAVITON, must be mass-less so the force is proportional to 1/r2, and it must have a spin of 2. Individual gravitons have never been directly detected. Every attempt to derive a complete quantum theory of gravity and to put it in a mathematical form similar to the other three FUNDAMENTAL FORCES has failed. Problems arise at very small distances, close to the PLANCK SCALE, where quantized theories of gravity have characteristics, described as 'quantum foam', that are not compatible with general relativity. This quantum foam represents fluctuations in the shape and form of the underlying spacetime and would lead to physical effects that are not observed. SUPERSTRING THEORY and other TOEs (see THEORY OF EVERYTHING) are attempts to quantize gravity, and to make it compatible with the other three fundamental forces. Although these theories are progressing, they are plagued by a lack of testable predictions since the interaction energies involved are well beyond the energies achievable in nuclear accelerators. It is quite possible that cosmological observations might be the only way to test string theories of elementary particles. quark Hypothetical subnuclear particles that are believed to be the fundamental building block of HADRONS (baryons and mesons). They have fractional electrical charges (+§ or — 3, compared with the unit charge carried by a proton or an electron), and have spin values of . There are believed to be six types, or 'flavours', of quark, designated 'up', 'down', 'strange', 'charm', 'top' and 'bottom'. The up, charmed and top quarks have charges of +§, while the down, strange and bottom quarks have charges of — 3. Up and down quarks have masses of 0.3 MeV, the others are heavier. Each flavour of quark has an antiquark with opposite properties. Each baryon is thought to consist of a cluster of three quarks (or antiquarks), while mesons consist of quark-antiquark pairs. For example, a proton consists of two up quarks and one down quark (u + u + d = +1 +1 — 3 = net charge of 1), a neutron consists of one up quark and two down quarks (u + d + d = +§ —3 —3 = net charge of zero), and a positive pi meson consists of an up and an anti-down quark (+§ + 3 = net charge of 1). Quarks also have a property called 'colour', which is analogous to electrical charge and has nothing to do with colour in the conventional sense. There are three different colours (and three equivalent anti-colours for anti-quarks). Hadrons have zero net colour, and this can be produced either by combining three quarks, each of different colour, or by combining two quarks, one with the anti-colour of the other. The requirement for zero net colour explains why baryons are composed of three quarks and mesons of two. The interquark force is known as the colour force, and the interaction between quarks is carried by mass-less particles known as gluons. The strong nuclear interaction between hadrons themselves is believed to be a remnant of the interquark force. The colour force is weak when quarks are close together, but becomes extremely powerful as quarks move apart, preventing quarks from escaping from within hadrons. Almost certainly, therefore, quarks cannot exist outside hadrons as separate free particles. quasar Most luminous category of ACTIVE GALACTIC NUCLEUS. The name is formed from the acronym QSRS (for quasistellar radio source) because the initial identification in 1963 was of several examples that had strong radio emission and appeared in the Third Cambridge Catalogue of radio sources. quasar This set of quasar images shows the bright nuclear activity that lies at the heart of these galaxies. Each of these quasars is probably fuelled by material falling into a massive central black hole. Quasars are characterized by a very luminous core source, with a blue continuum and strong, broad emission lines, strong X-ray emission, and, for quasars proper, strong radio emission, either from the core itself or from a double radio source much like that around RADIO GALAXIES. Any surrounding galaxy must be very faint, so that it would not appear on conventional photographs. Quasars generally have redshifts (z) greater than 30,000 km/s (20,000 mi/s) out to the largest values yet observed. Most quasars are variable on a variety of timescales, which set limits to the size of the emitting region. These limits are a few light-days or even smaller, which is one of the reasons for the popular model in which the ultimate energy source is material accreting into a massive BLACK HOLE. The exact origin of the observed radiation remains unclear in this model, particularly where the continuum radiation arises with respect to the accretion disk. Some information is now available on the host galaxies of quasars at moderate redshifts, thanks to data from the Hubble Space Telescope. 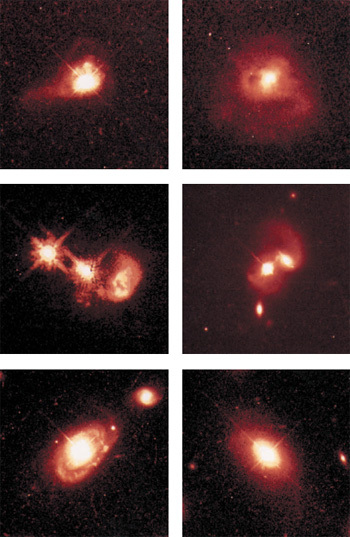 Radio-quiet quasistellar objects (QSOs) may occur in spiral, elliptical or merging galaxies, while radio-loud objects occur in elliptical galaxies or strongly merging systems. There is a marked excess of galaxies with very close, compact companions, showing that not only can some kinds of interaction trigger the QSO phenomenon, but also that it can happen in episodes not much longer than the lifetime of such an interaction (or a statistical connection would not be seen). Quasars form a continuum in luminosity and spectroscopic properties with type 1 SEYFERT GALAXIES, so that there are some objects that have been treated as belonging to both categories because of their intermediate luminosity. Various arguments have suggested that quasars and radio galaxies are related in a 'unified scheme'. This holds that most such objects have a core surrounded by a torus of obscuring material which absorbs radiation from infrared to soft X-rays very effectively, so that a quasar viewed near the plane of such a torus would appear as a radio galaxy. The population of quasars has evolved strongly with cosmic time. Going out in redshift from our neighbourhood, the space density of quasars increases dramatically to redshift z=2.2. Beyond that (at earlier times), the density declines again, perhaps indicating that the objects actually turned on for the first time at this epoch. Quasars are very important in the study of cosmology and galaxy evolution, not least because they furnish bright and distant background sources that allow detection of cool foreground gas (in and out of galaxies) via absorption lines. Quasars also allow the detection and measurement of foreground masses through GRAVITATIONAL LENSING. quasistellar object (QSO) General designation for an object with the optical and X-ray properties of a QUASAR, but without the strong radio emission. QSOs by this definition outnumber radio-loud quasars by about a factor of ten, although in loose usage 'quasar' is often used to include both kinds. Quetelet, (Lambert) Adolphe (Jacques) (1796-1874) Flemish statistician and astronomer, from 1828 director of the Royal Observatory, Brussels. Quetelet did important work on meteor showers and their radiants. In 1839 he published a Catalogue des principales apparitions d'etoiles filantes, which listed 315 meteor displays, calling attention to the recurrence of the Perseid meteors every August 12.
quiet Sun Term applied to the Sun when it is at the minimum level in the SOLAR CYCLE, as opposed to the active Sun. The quiet Sun shows reduced levels of FLARE, CORONAL MASS EJECTION, SUNSPOT and other activity. quiet Sun This time series of YOHKOH X-ray images of the Sun shows its progression through the solar cycle. 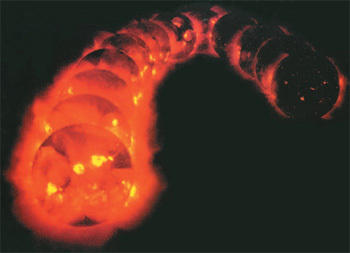 At maximum (left), the X-ray Sun is bright, with many strong magnetic loop structures evident in the inner corona above active regions. By solar minimum, the quiet Sun (right) shows only isolated X-ray bright spots. quintessence Undetected particles proposed as a fifth fundamental force. Observations of distant supernovae suggest that the Universe is accelerating. This fact, coupled with the COSMIC MICROWAVE BACKGROUND results and the fact that there is not enough observed mass to close the Universe, suggests that the cosmological constant in Einstein's FIELD EQUATIONS is non-zero. The physical manifestation of this repulsive force could come in the form of previously undetected particles called quintessence. Quintessence (or fifth force) would have negative gravity and would cause the Universe to accelerate its expansion. There is no complete theory of quintessence particles and some particle physicists think that if they exist, they must be the size of galactic clusters.